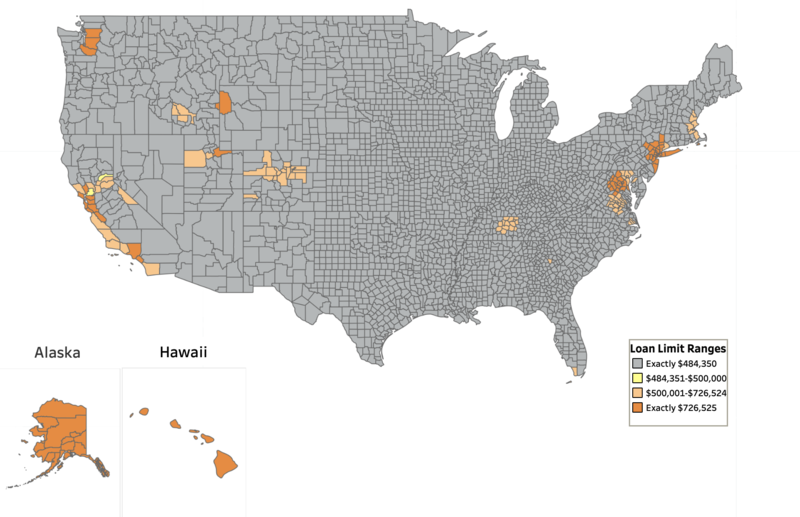 LoanLimits.org is a central repository for loan limit-related data and resources. This website offers 2019 loan limits by county, in all primary mortgage categories. We also publish local real estate data, such as home prices and housing market conditions, as a service to our readers. Use the applicable link below to find the information you need. Want an easier way to find the loan limits for your county? Use the interactive map. Just click the image below to get started. In November 2018, officials from the Federal Housing Finance Agency (FHFA) announced they would be increasing conforming loan limits in 2019 for nearly all counties across the U.S. This was done to keep pace with rising home values nationwide. We have since updated our website to bring you the latest and most accurate information. Though these limits have been aligned, VA borrowers and mortgage lenders should only refer to the “one-unit” column of the FHFA’s documents, according to the Department of Veterans Affairs. How Do These Limits Affect Home Buyers, Borrowers? Loan limits vary by county, and they are updated every year to keep up with home-price increases. Sometimes they are simply carried over from one year to the next, without any changes. Other times, county loan limits are increased in response to rapidly rising home prices. If you are in the market for a mortgage loan, you should research the limits for the county in which you reside (or where you plan to buy a home). You’ll find all counties of the U.S. listed within the VA, FHA and conforming pages on our website. It’s possible to secure mortgage financing above the 2019 loan limits. This is referred to as a jumbo mortgage loan. Jumbo mortgage products exceed the size restrictions set by the Federal Housing Finance Agency, and therefore cannot be sold to Fannie Mae or Freddie Mac. Lenders typically require larger down payments and higher income levels for borrowers seeking a jumbo loan, since there is more risk involved. If you would like to learn more about 2019 loan limits by county, and how they are established, visit the overview page for the particular category you’re interested in (FHA, VA or conforming). You can also find more information about the various loan limits on FHFA.gov, HUD.gov, or VA.gov. Disclaimers: This is not a government website. The information on this website was compiled from various official sources. We have made every effort to ensure the accuracy of the 2019 county loan limits published on this site. But there is always a chance for errors or inaccuracies. For the most accurate information available, please refer to the appropriate government agency or department mentioned above. If you find an error on this website, please send an email to info@loanlimits.org.